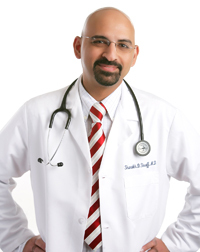 Dr. Shroff has been a practicing rheumatologist at Spectrum Medical since July 2008. He is Board Certified in both Rheumatology and Internal Medicine. He specializes in the treatment of rheumatoid arthritis and other diseases of the joints including osteoarthritis, gout, lupus, osteoporosis, fibromyalgia and tendonitis. He previously worked at the Arthritis and Osteoporosis Center of Brooklyn, New York.